In the fall of 1999, something happened that set the wheels in motion for a new invention. At Northern High School, Accident, MD, the rope climb in the gym was removed due to high liability insurance. It was considered too dangerous for students to climb thirty feet without safety equipment. Darren Kamp, Avilton, MD, who graduated from Northern in 1983 and had used the rope climb during his training for wrestling, had two sons attending Northern at the time. They were also involved in wrestling. He felt that the rope climb was a good exercise, and he didn't want to see it eliminated. Darren decided to create a safe way to climb rope with the help of his brother, Kelby Kamp, Avilton, MD. Together, they came up with Mt. EverClimb, a continuous rope-climbing machine that simulates actual rope climbing. 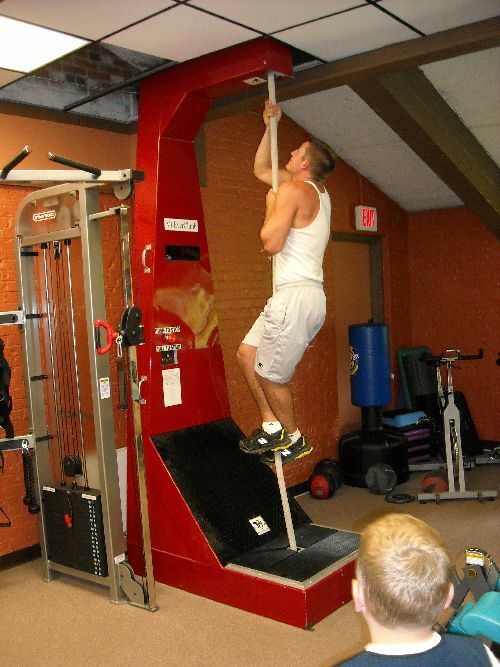 "After five years of work through trial and error, I felt we had built a rope climb exercise machine," Darren said. "This one piece of equipment enables users to achieve a full-body strength and cardio workout. Some of the benefits of this type of combined anaerobic and aerobic training include increased strength, lean body mass, improved posture and muscle balance, and increased bone density." The machine features a heavy-duty welded tubular steel frame, a pulley wheel, and a looped rope that creates a continuous climbing action. A front-mounted switch box allows the user to control speed, power, and direction of the rope. Realizing that he had a unique product with no rival on the market, Darren went to the Invention Submission Corporation (ISC) for assistance in obtaining a patent for the machine (patent pending). ISC also drew up a basic information package on marketing for the product. The brothers continued to improve the product, and in 2007 Darren met with Beverley Williams, a small business consultant in Garrett County, MD. She took an interest in the product, and introduced him to Casey Willson of the Maryland Small Business Development Center. "Beverley and Casey helped me get a grant from some marketing assistance provided by The Minor Group Inc. (TMG)," Darren explained. TMG provided a marketing study with recommendations in the fall of 2007, and the next year, the brothers applied for a safety test with the Long Island, N.Y. branch of Underwriters Laboratories Inc. The application was accepted and is in process. In the meantime, a fitness trainer in LaVale, MD, has been using a Mt. EverClimb prototype in her center for the past two months. "This trainer is very enthusiastic about the machine, uses it personally, and has several clients now using it in their training sessions," Darren said. The machine has numerous safety and adjustable features that allow individuals to exercise at their own pace, accommodating users at any workout level. It offers a controlled environment within a limited amount of space for a safe climbing experience. The machine can be used for conditioning for the upper body, arms, and shoulders, hands, lower back, legs, and knees. Darren feels that Mt. EverClimb is ready at this point, thanks to personal financial input and assistance from friends, as well as business consulting advice through the Garrett County Economic Development contract for consulting services with Beverley Williams. "An old saying I live by has kept me going and gotten me to this point," Darren said. "I worked for so long with so little that I can do anything with nothing."